With opinion polls ahead of next week’s election showing the two candidates for President approximately tied but giving Barack Obama a slight edge in the Electoral College, there now exists the real possibility that the latter could be reelected despite losing the popular vote. In other words, we could have a reversal of 2000. Now perhaps this occurrence is less likely than it appears to be, but in some ways, it could be an ideal outcome. First, Mitt Romney would not be President, so yay! 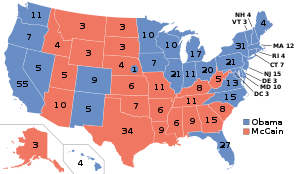 Second, the sight of an Obama win despite his second-place finish in popular support might be just the infuriating kick in the crotch Republicans need to align themselves with efforts to get rid of the Electoral College. And with Democrats still fuming over George W. Bush’s victory over Al Gore in 2000, this kind of reform might actually have a chance. The Electoral College is the archaic institution that — despite all the symbolic hoopla of a one-person-one-vote national election — is solely responsible for selecting the President of the United States. Its members are chosen by state governments on the basis of state-by-state results of the national vote. In other words, whichever Presidential candidate wins in a state gets all of that state’s Electoral votes (except in Maine and Nebraska where Electoral votes are distributed by Congressional district). The problem with this method of indirectly electing a President is threefold. First, there is the aforementioned chance that the popular vote winner might lose the election, an anti-democratic travesty that has already occurred in 1876, 1888, and — most famously — 2000. Second, states with small populations are overrepresented in the Electoral College (be afraid, dear Republicans, this sounds suspiciously like redistribution!) — with one Electoral vote being worth 478,000 eligible voters in Pennsylvania, but only 139,000 in Wyoming. And third, it is thanks to the Electoral College that Americans must put up with the absurd spectacle of virtually all the campaigning in a supposedly national election occurring exclusively in ten to fifteen “swing states.” Taken individually, the majority of American voters who live in “safe states” — red or blue — have virtually no impact on who wins the Presidency. So what can be done? Even with considerable bipartisan support, there is little chance of a Constitutional amendment abolishing the Electoral College. Such a reform would require two-thirds support in both houses of Congress, plus the approval of three-quarters of the states — an almost prohibitive level of consensus. Thankfully, there exists an alternative in the form of the National Popular Vote Interstate Compact. According to this voluntary agreement, state governments pledge to distribute all their Electoral votes to whichever Presidential candidate wins the national popular vote, regardless of in-state results. Once the agreement comes into effect with states representing more than fifty percent of Electoral votes signing on, it would, in effect, allow the Electoral College to be bypassed without having to bother with a Constitutional amendment. And with eight states and the District of Columbia already having agreed, advocates of this plan are nearly halfway to their target. So now it is only a matter of finding the other half. If Mitt Romney wins the popular vote next week while Barack Obama wins the Electoral College, it is conceivable that more than a few red states might climb aboard the popular vote bandwagon, and the United States could be one giant step closer to this strange idea that in a democracy, you vote for your leader directly. This entry was posted in American Politics, Democracy and tagged Barack Obama, Democratic Party, Electoral College, Mitt Romney, National Popular Vote Interstate Compact, popular vote, Republican Party, safe states, swing states by David Taub Bancroft. Bookmark the permalink. Notwithstanding historical differences between republics and democracies, the United States today is usually considered both. I fail to see how a reform like election by popular vote (used to elect governors and state and federal legislators) would cause the country to descend into mob rule. Happy face indeed! I still sort of wish Romney had won the popular vote. Well, if he did, it may affect to change this electoral college thing, but then it would mean more people agrees with him, which is scary. American politics is already scary. I just wish something would motivate them to reform unjust institutions.